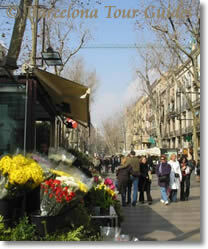 La Rambla (formerly known as "Las Ramblas") is probably the favorite election of travelers in search of fun; the 1.2 km long tree-lined avenues runs from Catalunya Square down to the Columbus monument, dividing the Old Town in two very different areas: to the left, the Gothic Quarter and to the right the Raval. The Rambla has very few high-end hotels but boasts a huge offering of cheaper accommodation. It is a beautiful avenue and once you get tired of looking at the crowds, there are nice examples of architecture from the 17th c. onwards. Most of that area (Old Town) is pedestrian-only and even though this might present logistical difficulties if you carry a lot of luggage or plan to move about by car, it is the nicest area to be when on foot. 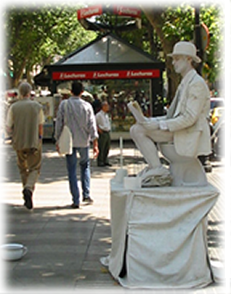 The famous Rambla avenue is a non-stop show. The atmosphere and the crowds change along the day, from very familiar by late afternoon or early evening to frankly weird late at night. The Raval is a conflictive area and more so at night. Choose anywhere else... unless you know what you are doing and looking for. 5 Stars: There are only 3 luxury hotels on La Rambla: one a each end: Le Meridien and DO Plaça Reial G.L., and one in the central part: Bagués. 4 Stars: Rivoli, Royal Ramblas, 1898, España Ramblas, Petit Palace Boquería. Where are the famous street performers? Well... the municipality actually banned them except on a very short stretch of La Rambla, down by the Columbus monument! They caused traffic jams! Unfortunately, the municipality has not been that efficient in eradicating other "professionals" such as pickpockets, drug-pushers, hookers, etc.